DRAMA: And so, after a fair amount of pre-performance 'drama' we had the first run of Hunuwataye Kathawa at the Lumbini Theatre, Hv. Town on five consecutive days - from the 8th of March 1967 up to the 12th. Our Chief Guests for the five days were as follows: - 8th March - Mr. Ludwig Zempleburg, Consul General of the Consulate of the German Democratic Republic and Mrs Zempleburg, March 9th - Lester James Peries and Sumitra Peries, 10th - Chitrasena and Vajira, 11th - Anton Wickramasinghe and on the final day, ie., the 12th - Senator Reggie Perera and Mrs. Perera. We had agreed unanimously that we will not invite any big-name politicians as our Chief Guests. We invited Artistes and men like Anton Wickramasinghe who were promoters of art. The first day invitation to the Consul General of the German Democratic Republic was a gesture of gratitude - he had helped our production with costume and set designs from the Berliner Ensemble production and a whole lot of other useful material. I always believe that the best publicity a play or a film could get is word-of-mouth praise. I find it a far more potent form of publicity than any Press or even electronic media publicity. That is what happened to our Hunuwataya too. At that time we had only two points for the sale of tickets - at McCallums Bookshop in Pettah and at the hall on the day of the performance. I have no records of the sales at McCallums but I do have the hall sales records. On the first day we had collected Rs.268/- as hall sales [the tickets were priced at Rs.5/-, Rs.3/- and Rs.2/-! ], on the second day we had collected Rs.535/-, third day we had Rs.780/- worth of hall sales, on the fourth day we had collected Rs.928 and on the final day we had collected the impressive sum of Rs.1561/- as hall sales. All the publicity we had were a few hundred posters [lovingly executed by my friend Edwin Hewakapuge], a couple of 3" advertisements in the Daily News, and a few small write-ups in the Sinhala as well as the English press. The main publicity we received was by word of mouth, I am certain. The Rs.1561/- hall sales on the last day indicated above means a total of 432 persons who bought their tickets at the hall. There must have been a sale of at least 300 tickets at McCallums too. The total would be more than a full hall at the Lumbini Theatre. In fact on the last day we had to turn people away. The hall was full long before opening time. We simply HAD to give freestanding accommodation to a few people who had come from afar to see the play. The book was also launched simultaneously. It was priced at Rs.2/50. It sold like hot cakes - or rather like 'unu kevum'! I believe the main reasons for the sale of the book were the 'unusualness' of the play and the memory of its haunting melodies put into the songs by Maestro Shelton Premaratne! An epic style play such as Hunwataya had not been performed on our stage before and such a captivating spectacle had not so far been seen by our audiences. We had done a good job with the play. We had good wishes for the production from Mr. Martin Wickaramasinghe too. In a note to our souvenir he had said thus: - "The Caucasian Chalk Circle is a play full of dramatic content and conflict which satirizes human foibles in our society. It is said that the author drew inspiration from an old Chinese folk tale in introducing the device of the chalk circle to determine the ownership of the child in the last scene. It is possible that the Chinese folk tale took inspiration from the 'Putra Prashna' of the 'Ummagga Jataka'." Senator Reggie Perera had sent us a typical message of good wishes - " In the arena of the Ceylon Cinema films like 'REKHAWA' 'GAMPERALIYA" and 'SATH SAMUDURA' have had to tiptoe in cautiously like an ULANOVA amongst the gladiators. It is the pride of the Sinhala theatre that the situation is the reverse .No one dare place before an audience the counterpart of the 'Formula Film' or theatrically ineffective stuff. HENRY JAYASENA has hit a new peak in this process by the very selection of 'THE CAUCASIAN CHALK CIRCLE'. My friend Earnest McIntyre had said - "As a player in this production I cannot help but marvel at the originality of theatrical approach I have witnessed." The five-day first run was unusual. Normally it would be just two days - three at the most. I took a risk here. I knew the production was good and that it should attract crowds. I had only one worry - the NAMES of the characters in the play. Names such as GEORGI ABASHVILLI, BYZAREN KAZBEKI, GRUSCHE VASHNADZE, NIKA MIKADZE, MIKA LOLADZE. SIMON SASHAWA and ILLO SHUBALADZE would sound as tongue twisters to an audience who has never been presented with such unusual characters in a play. I need not have worried. With the intrinsic interest that the play created in the minds of the audience from the word go they seemed to have totally forgotten the jaw breaking names of the characters. In any case the character names of the main players such as Grusche, Simon Sashawa and Azdak were not all that difficult to remember. The other important character was the Narrator [Pothe Guru] and there was no problem about that. And so, as my good friend Karen Breckenridge had predicted, the play went off like a bomb! Another prediction was made during that first run, by no lesser person than Lester James Peries himself. He and Sumithra were the Chief Guests on the 2nd day. When they came back stage to congratulate us, I asked Lester whether the production would have a run of at least 50 performances. "Fifty!" Intoned Lester with that special smile of his. "My dear Henry, this show will have a run of at least a five hundred!" He declared thumping me hard on the shoulder. "I will take a bet on that!" He added. Naturally, I was over the moon. Lester was quite right. Wrong in a way but so nicely wrong. Over the last forty years or so we have been performing Hunuwataye Kathawa we must have easily given over a three thousand performances all over the country. I must admit I have not kept exact records. During my five and a half years or so at the Rupavahini Corporation, I was too busy to keep strict accounts of our performances. I was so busy I had to even miss out on some of the performances during that time. We were eagerly awaiting for reviews of the play and the production. The very first review appeared in the Daily News of 11th Match, 1967. It was written by a person who signed off as 'M.W.' [Mallika Wanigasundera, we came to know later] This was just one day before the end of our first run. I started reading it with great enthusiasm with Manel listening beside me. Midway through I was unable to proceed as a mist was blotching my sight - it was such a warm review. I tried to proceed and gave up. There was a soft touch on my shoulder. "Never mind me, my dear. You can let yourself go. Wipe your eyes and let's read it together this time.." Manel's voice came over my shoulder and then we were laughing. We laughed together and managed to go through the review. I had read plenty of reviews of my plays in the newspapers before. But never such a marvellously complimentary one. "Henry Jayasena's translation left an impression of definitive authenticity which one sees very seldom on the Sinhala stage. It was beautifully lyrical. The lyrical refinement of the language soared to capture the poetic heights of the Brectian original. The music had a lyrical and pastoral quality.." Although we were smiling while we looked at each other, there were tears of joy behind those smiles. There was the warmth of our total commitment to a cause over so many months. There was the sweet smell of the sweat of a young couple who had dedicated their very lives to the stage. There was the taste of lost meals - lost in the weariness of a trying day's work. We did not have telephones in our homes at that time. So we could not share the happiness with the other members of the cast until evening. We carried the newspaper when we went to the hall that evening. Several other members of the cast too had seen the review and they also brought their copies of the Daily News to the hall. We had a good laugh over that. The production was reviewed later too in practically all the newspapers of the day. They were all very complimentary. A particular reviewer - E.C.T. Candappa writing to the Sunday Observer Magazine of 9th April 1967 had said - "I have had the supremely enriching and eminently satisfying experience of seeing the HENRY JAYASENA production of Hunuwataye Katawa and if this assessment turns out to be more of a standing ovation than a review I make no apologies for it. Rarely have I been so enraptured, so thoroughly regaled, so warmly moved by a piece of Theatre.." In most reviews Manel's portrayal of the beleaguered Grusche came in for a lot of praise. Also my playing of Azdak, Warakagoda's Narrator and Santin Gunawardhana's Simon Sashawa. All the reviewers and indeed all the audiences were ecstatic over Maestro Shelton Premaratne's music and his lilting, haunting melodies. Everyone who saw Hunuwataya went home with one of its songs on their lips. Such was their appeal. With all this praise we were in the seventh heavens. All the praise and plaudits bonded us together even more strongly. The men who came over to us from the English stage were as ecstatic as we were. Requests for outstation shows were pouring in even before we could complete the first run. A very unusual and innovative man - Musaician, Teacher, Novelist, Radio and Theatre man, K. Lionel Perera - passed away last week at the ripe old age of ninety-one. He was born in 1916 and at the very young age of nineteen, in 1935 to be exact, he launched on a very unusual career - to teach music by post. He called his Academy - 'SANGEETHODAYA' - this was a very novel idea. Hundreds of music enthusiasts registered themselves with 'Sangeethodaya' and sought Lionel Perera's guidance to be able to play a musical instrument. His strategy was, first to introduce the musical instruments - how to handle them, preserve them and how to treat the precious thing. This followed notes of melodies and thaals sent by post. Every two months the pupils had to present themselves at his Aashram and demonstrate what they had practiced. When I was a young man, K.Lionel Perera was a household name. Maestro Lionel Perera's daughter, Nelum Perera, tells me that her father had trained thousands of musicians in this manner and that his Academy was kept alive for seventy years - until 2005. Men like Arisen Ahubudu and even Ranasinghe Premadasa and Tissa Liyanasuriya were his pupils. One of the brightest stars that he produced was Dharmadasa Walpola. 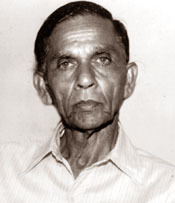 A father of six girls, Lionel Perera was also a novelist of no mean repute. 'The man from Mars' [Angaharu Lovin Aa Minisa] was the very first science fiction novel our generations had read. 'Anduru Gedara', 'Saapaya', 'Sylvia Randeniya', 'Paarvathi', 'Damanaya', 'Anjalee', 'Chandralatha' and 'Yakage Yatura' were some of his other novels. Some of them had gone up to ten editions. K. Lionel Perera had directed the music of the very first production of the Tower Hall play 'SAMUDRA DEVI'. He had worked with all the masters of the Tower Hall - including Sirisena Wimalaweera and J.D.A. Perera. I bow my head in admiration - to the very last of the 'Masters'.